A native Windows Phone application is under development and will be available in the Marketplace. In the meantime, OnTime Mobile Web is 100% compatible with Windows Phone. From the Windows Phone device, start Internet Explorer. Enter the URL from step 1 into the address bar of Internet Explorer. If your Windows Phone device is connected to the internet properly, you should see a log in screen within a few seconds. 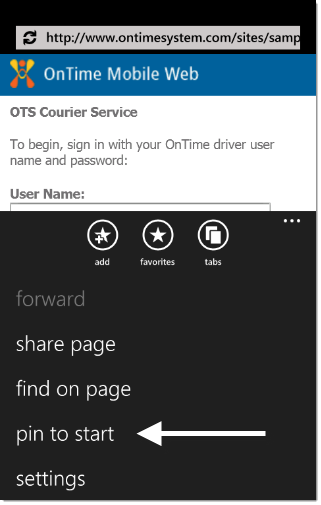 To make it easier to access OnTime Mobile Web on the phone later, use Internet Explorer's Pin to Start feature.